Unmatched scrobbles are track plays which can’t be matched to a track within your MediaMonkey database. AlbumPlays alerts you that there is a problem by using the yellow “!” icon an the Run Summary dialogue box. update your track so that its tags match those received back from Last.fm. You update your track tags using MediaMonkey. If you have corrected the situation by either of the first three methods, press the Run button to retry the Approve action. (nb: a retry is built-in for the Streaming Wizard). The batch will be automatically closed if all mismatches are now resolved. The tools in the above list are covered in detail here. 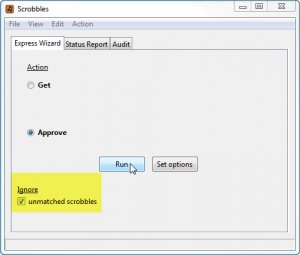 Or you can force-close a batch by checking the unmatched scrobbles check-box control in the “ignore” section of the Wizard, and then pressing Run to re-run the Approve action. Any remaining unmatched scrobbles will be discarded. Some scrobblers are better than others; many can lose scrobbles if the Last.fm site is down, or stressed. The same thing may happen when there is some problem or congestion on your LAN or Internet connection. Sonos owners: Native Sonos scrobbling is on a best-effort, no-promises basis. Sonos sends the scrobble off to Last.fm, but doesn’t check nor care whether Last.fm received or successfully processed your scrobble. In my case I calculated that 4% of my scrobbles were lost for one reason or another. 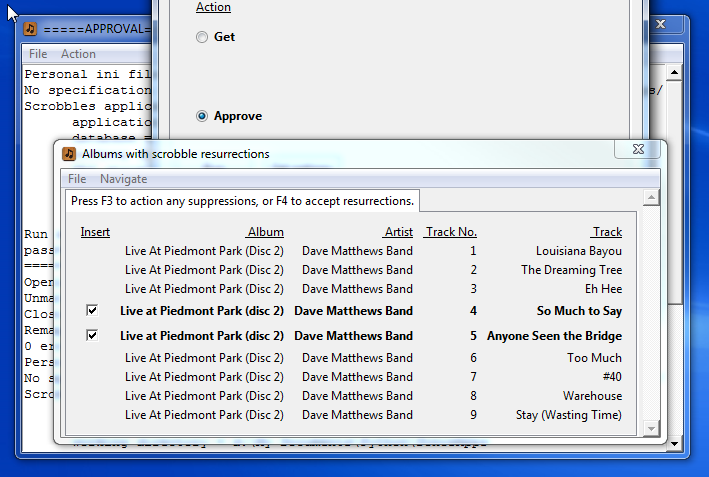 In the illustration shown here, two scrobbles were lost from my Dave Matthews Band album. The application has detected this, and has determined that there was an unaccounted for time gap, amongst the scrobbles which it did receive, and that gap was long enough for the missing tracks to have been played. The application pops up a dialogue box offering to resurrect these lost scrobbles. Unless you uncheck the check-boxes for the lost tracks, and press the F3 key, the application will add the lost items back into the batch of fresh scrobbles. To accept the resurrections you may just close the dialogue box by the F4 key, or any other method. Although it does not repair your Last.fm history, these plays will be successfully recorded into your MediaMonkey database. The Task Complete summary dialogue box confirms that the resurrections were successful. It is not difficult to generate unintentional, and unwanted, track play duplicates. This may be caused by finger fumbles when interacting with your Sonos controller or music client, or may be caused by a scrobbler becoming confused by music interruptions on your mobile device due to a phone call or some notification message. nb: a ‘duplicate‘ is defined as being more than one play for the same artist|album|track in the latest Get batch .. ie. the play does not need to have an identical time stamp for it to be seen as a duplicate. .. nb: truly duplicated scrobbles, ie. 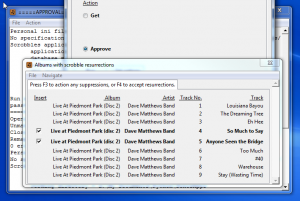 exactly the same date and time, don’t require any intervention as AlbumPlays will automatically and silently filter them out. Track play duplicates aren’t necessarily an error condition, as these would be expected when you replayed any tracks in the duration since the previous Approve action. These options are available both for fresh scrobble imports from Last.fm, as well as for Sonos track Spy mode observations. 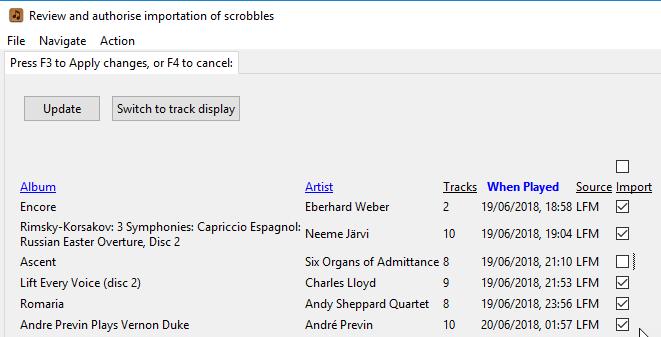 AlbumPlays default behaviour is to silently accept duplicated plays, as this is the most useful setting when initially seeding your database from historic scrobbles. You can change this default as described here, or here if you are using Spy mode. 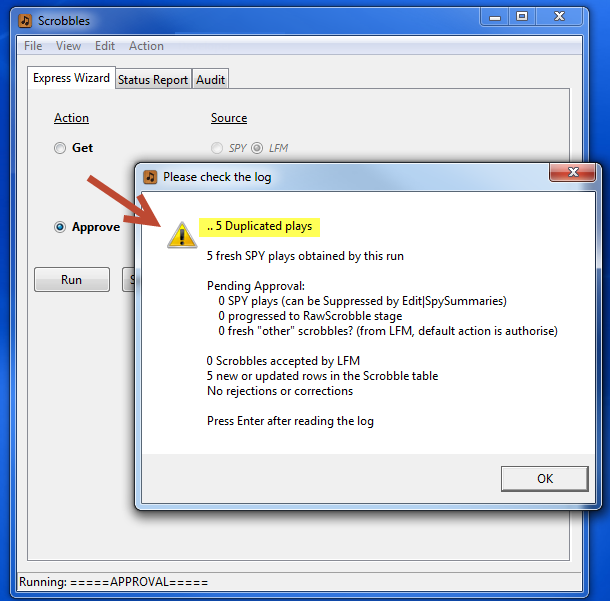 If you configured AlbumPlays to offer suppression of duplicate plays, the Approve action will pause with the following dialogue box. If press the “yes” button, the duplicates will be suppressed; … ie. not synced to Mediamonkey, and not scrobbled either if you are using a Sonos in Spy mode. If you configured AlbumPlays just to warn about duplicated track plays, the Run Summary will display the warning icon and a warning message. It is up to you to determine whether or not this is an unexpected situation. 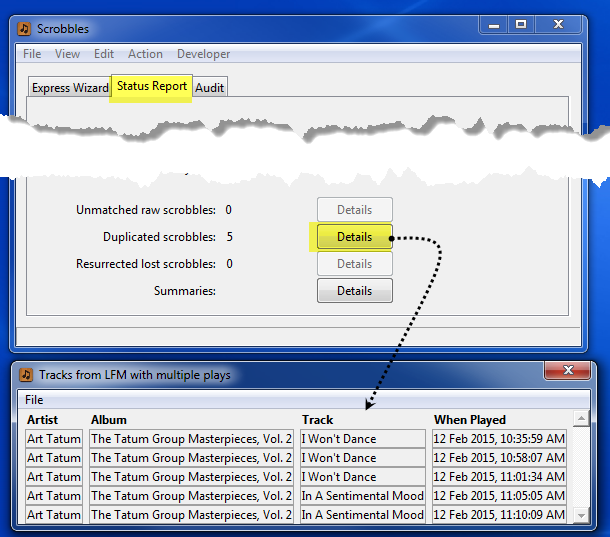 Navigate to the Status Report tab if you wish to see which tracks had multiple plays. If you determine that any single track play has generated multiple scrobbles, you will have overstated your play history in Last.fm, and maybe in MediaMonkey also. If you care about your Last.fm play history, open this section to see how to correct your Last.fm history. Go to your Profile page or Library|Scrobbles page at Last.fm, and identify the unwanted scrobble. Delete the scrobble as shown below. 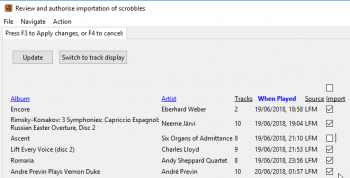 If unwanted duplicates have been synced to Mediamonkey, the Track Maintenance section describes how to display all individual scrobbles for a track, and to delete any unwanted plays. “Late Scrobbles” are those whose play date is before the date and time that AlbumPlays has already progressed to. … Typically these scrobbles would be from a mobile device, which caches your plays until a time when you are ready to submit them to last.fm. If your home player scrobbles to last.fm at the end of of each track, you can get a situation where the cached plays seem to be historic, ie. before where AlbumPlays will look for fresh plays. For performance reasons AlbumPlays only downloads last.fm scrobbles which appear to be fresh. AlbumPlays’ Status Report tab shows AlbumPlays’ event horizon. It only looks forward from the time that the last track was played. nb: it is safe for AlbumPlays to search back through recent history. AlbumPlays cannot double count Last.fm scrobbles, because multiple scrobbles, played at exactly the same instant in time, are silently rejected. 5. and then run the Get action .. 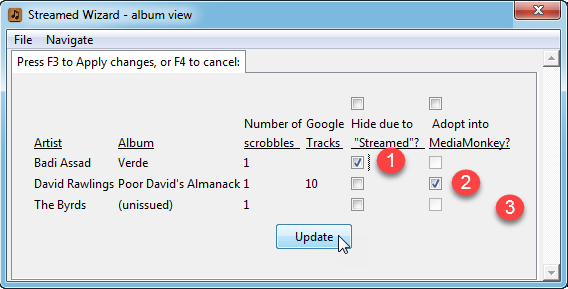 This option is relevant only when in Spy mode, and you have also configured AlbumPlays to scrobble. 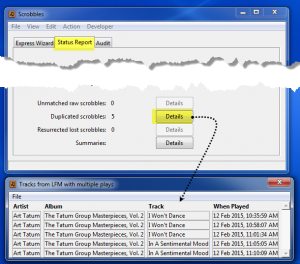 You may configure AlbumPlays to never scrobble specific tracks, for either a specific Listener, or for all Listeners. These tracks still have the option to record their plays in MediaMonkey, but they would not be scrobbled to the specified Last.fm accounts. Track selection for this optional feature, is by Genre. You may specify one or more genres to suppress for a specific Listener, and|or for All Listeners. nb: remember that MediaMonkey allows you to assign multiple genres to any track, so the easiest way to use this feature may be to invent some non-scrobbling genre name, and then assign it, as an additional genre, to all the tracks that you want permanently suppressed from scrobbling. · Importation Review is OFF by default in LFM mode … you may call it from the Status tab, as described below, or you can reconfigure AlbumPlays to make it a regular part of the get action, as described here. 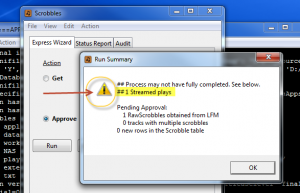 The Importation Review panel is a regular part of the Get action in the regular cycle, and can be explicitly called by pressing the Review button on the Status Report tab of AlbumPlays’ main screen. 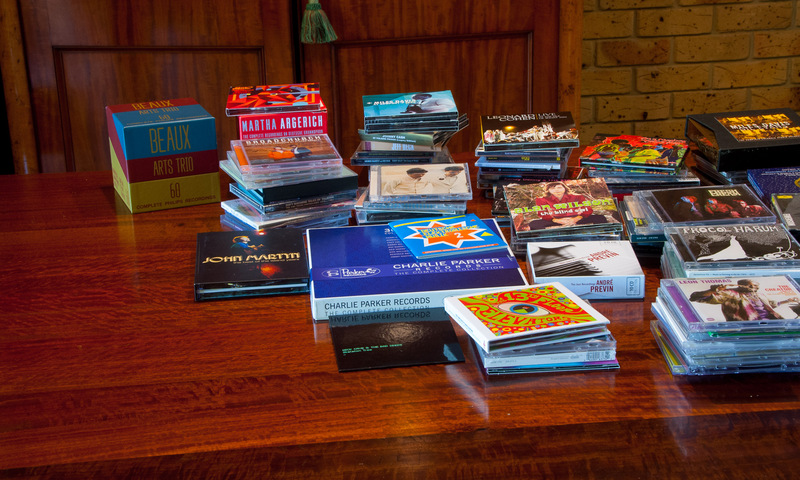 The Importation Review panel is summarised to suit your listening preference; ie. review is at the whole album level for album-focused listeners, and at the individual track level for people who listen to mixed track playlists. … There is also a button allowing you to toggle the display between a detailed individual track view, and the album summary. You can click on the indicated column headings to resequence the order of the rows; ie. by Date Played, vs re-sorted by Album, etc. Due these batch size considerations it is best if you leave the Importation Review facility turned off while you are seeding the database with your historic play history from last.fm. 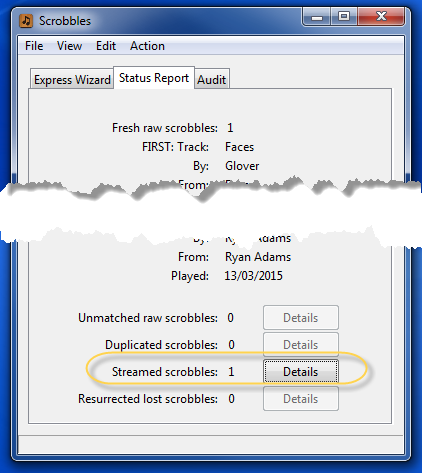 The Streaming Wizard is an optional addition to AlbumPlays’ regular Approve processing action. 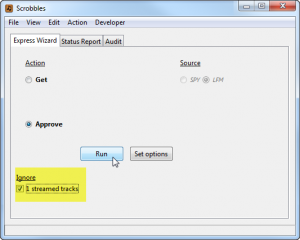 The Wizard is aimed at simplifying the handling of unknown streamed items. It is turned off by default, and is best left off if you are in the process of seeding your database from historic scrobbles. Once you have reached your current scrobbles, you may consider turning it on, if you listen to tracks from a streaming service, especially from Google Play Music. or this is a Spy observation of a Sonos track play; in which case we know that it was a streamed play, but we can’t determine which track was played … maybe it is not in your MediaMonkey database? … or maybe it is in there, but AlbumPlays needs some assistance to resolve mismatched tags? If you made any updates, close the Streaming Wizard panel via the “Update” button, or the F3 key. If you made no updates, you may just close the window with the Windows red “x” on the top right corner, or press the F4 key to cancel without update. I have turned the Streaming Wizard ON, or here if in Spy mode. 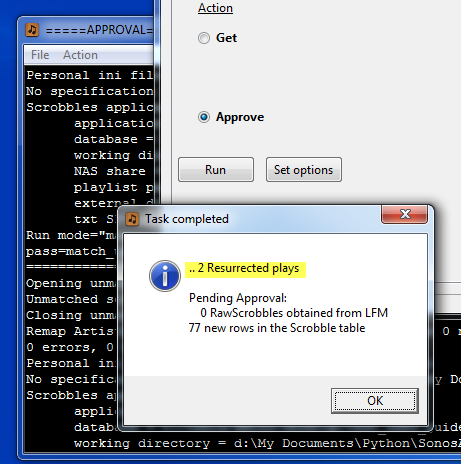 it pauses the Approve action, and displays the Streaming Wizard panel, and waits for input. I own the track by the Byrds,and this scrobble was generated from my own local track … because I re-tagged my track, before approving the scrobble, AlbumPlays has been unable to recognise the scrobble … an unrecognised scrobble may be a streamed scrobble, which is why it appears in the Streaming Wizard … I know that it is not streamed, so I ignore this row … it will fall through to the standard processing for unmatched scrobbles, and I will handle the situation there. where you make any updates to the Streaming Wizard panel, you must close the panel via either the “Update” button, the F3 key, or the Navigation menu. There is an update log for any adopted items. This section describes AlbumPlays’ default behaviour with regard to unmatched plays from Streaming sources (ie. plays of tracks which you don’t own, and are not in your MediaMonkey database). This section covers the case where you are using AlbumPlays in Last.fm mode, or when downloading non-Sonos plays from Last.fm. In these situation AlbumPlays has to try to deduce whether a scrobble has be played from a streamed source, as Last.fm doesn’t record the music source. This does NOT apply to Spy observations from Sonos units, as that mode is better equipped to detect and handle tracks played from streamed music services. Open the following “Spy mode” drop-down section to see which of this applies to your Sonos plays from streamed services. AlbumPlays attempts to address this by detecting tracks which appear to have been streamed, and filtering them away from view in your action list of unmatched scrobbles. If the assumption that a scrobble was streamed is incorrect you could fail to detect the mismatch, meaning that the play would not be recorded. AlbumPlays can warn you if the current batch of fresh scrobbles from Last.fm contains any unmatched scrobbles which are assumed to have been streamed. … I say assumed because Last.fm doesn’t record the source of the tracks which you have played, so the actual source is uncertain. It makes this assumption in an attempt to reduce the clutter when you are trying to deal with mismatches. 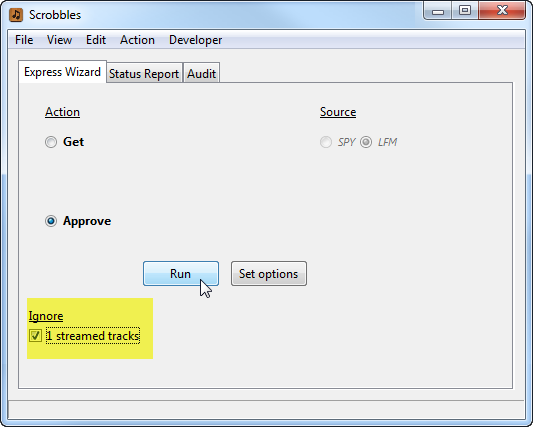 It filters away any suspected streamed items, allowing you to better focus just upon any of your own tracks which remain unmatched for some reason. This assumption does create the potential that a false assumption could lead to some unmatched scrobbles from your own track plays being silently filtered away. This would suppress those tracks from being uploaded to MediaMonkey. There is relatively little chance of this occurring, as it can only happen if both of the above two conditions are met. There is a safety net aimed at further minimising the risk of plays being silent ignored. 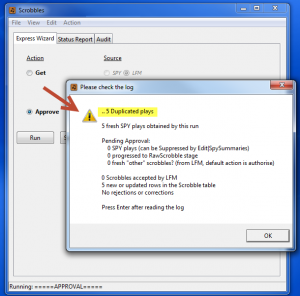 By default the application pauses, and requires you to acknowledge the streamed tracks warning message, to confirm that the assumptions made by the application are correct. If you listen to streamed material upon a regular basis you may want to turn this feature off. If you leave this safety net active, to bypass the warning message, you need to check the check box, and then press the Run button again. 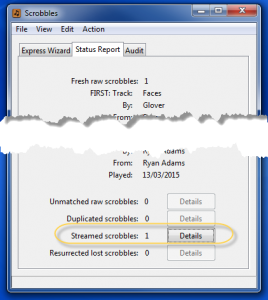 To assist with this decision you can display a list of the tracks which have been assumed to be streamed using the Streamed Scrobbles button on the GUI’s Status Report tab. You should fix any tracks that you notice where AlbumPlays has made an incorrect assumption. 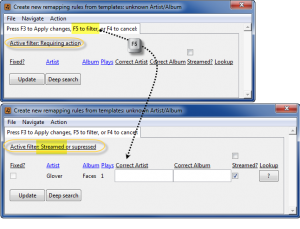 You do this by updating the rule template which has been generated for this track, but which is initially filtered from view. To disclose any filtered template rules you toggle to the streamed tracks display by pressing the F5 key while editing the rules (ie. 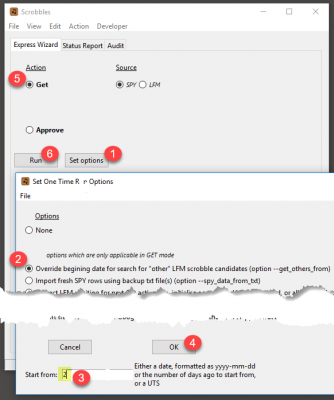 using either the Edit|ActionListAlbumBasedRules or Edit|ActionListTrackBasedRules menu item. 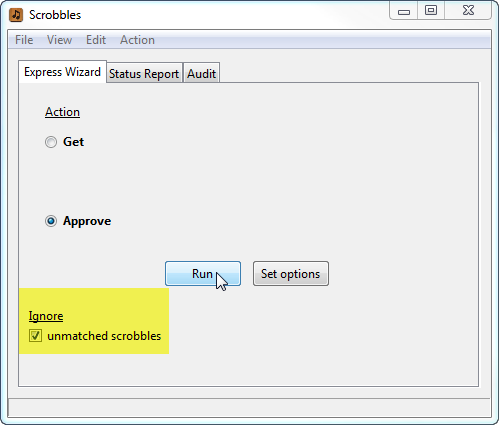 and flesh out the template to allow the scrobble to be successfully matched against your tracks tags. You only need to to do this once, as the completed template will become a rule. When the track is replayed, either from your own library or from a streaming service, it will be successfully matched, and therefore will no longer be flagged as a unmatched streamed play. at the moment it only reliably detects lost scrobbles when there is just one single Sonos zone, or group, actively playing music. — ie. it may not detect lost scrobbles if you have several independent Sonos zones or groups playing from different albums at the same time — I may fix this at some stage. Let me know if you are affected by this limitation. nb: the resurrections action report can appear somewhat confusing if the fresh batch of scrobbles contains multiple plays of an album with resurrections. Each resurrection is displayed on its own row, so that you can confirm or suppress each individually, but the any contextual rows, showing tracks which were not lost, display only once regardless of how often they were played.